Day 2 passed with more mandarin oranges and the last Pink Lady apple. Saturday night, I made a late dinner with more goodies from our Eatwell Farm box. When the spinach was finally clean, I lined the toaster oven pan with foil and greased it with olive oil. I sprinkled salt and squeezed some lemon juice over a wild salmon fillet, laid a few sprigs of dill on top (from the freezer), and cut a few slices of lemon to lay on top. I stuck it in the toaster oven at 350 degrees for about 20 minutes. While the salmon was baking, I washed off a few leaves of the romaine lettuce from our produce box. The lettuce had a lot of dirt on it as well but it came off much easier. I had just gotten some mushrooms and oranges from the Farmer’s Market that morning, so those got sliced into the salad along with some leftover red onion. I mixed together a quick dressing of olive oil, orange juice (from the end pieces of the orange), salt, pepper, and sugar to drizzle over the top. With the salad ready, I mixed up some softened butter with minced garlic and spread it generously on two slices of french bread from a local bakery. The salmon was nearly done so I started cooking the spinach. In a non-stick pan, I melted a generous chunk of butter, then added the spinach stems and let them cook down just slightly. 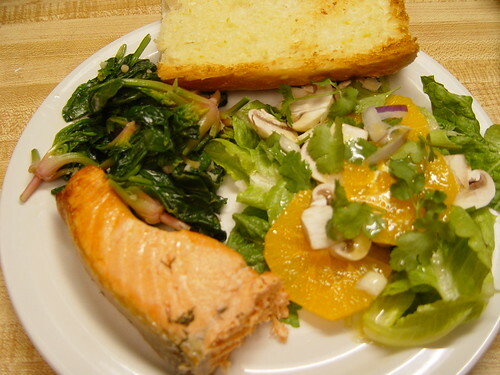 I added minced garlic and the rest of the spinach and salted it lightly, then let it all cook down while I pulled out the salmon and quickly broiled the garlic bread. I find a good way to clean really muddy spinach is to fill your sink or washing up bowl with cold water and just dump it in there for 10 minutes. The water gets around and in between the leaves better than rinsing under the tap. So long as the water is fairly cold your spinach will stay nice and crisp. 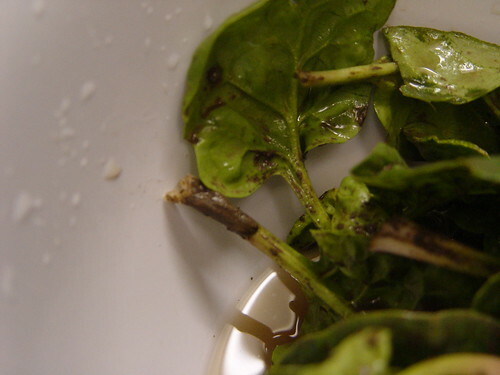 A big colander or salad spinner will help to get the spinach out of the water (leaving all of the grit in the bowl). I think you are well on your way to creating a grand cook book, Corrie…something about eating locally, pre-natal health, and slowing down to put love into your cooking. Let us know when we can buy the e-book version! Yum! Thanks for the tip, Sophie! Erica – thanks for the kind words!